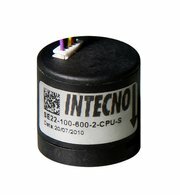 SE22 is a high performance, hollow shaft micro encoder. The device provides one, two (or two plus index) incremental encoding square wave signals outputs. The encoder is available with several resolutions, shaft diameters and output circuits, depending on the application. The standard model: 5V power supply, single ended output, optical model. The encoder is also available with several power supply solutions, i.e. 7V~30V and 5V with line driver output. Output type standard: pull up (TTL compatible). On request: push-pull, NPN open collector.